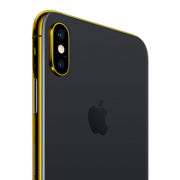 The Apple iPhone Xs Max runs on a powerful A12 Bionic chip that delivers high performance with respect to both, speed and efficiency. The neural engine, with the help of machine learning, enables your smartphone to learn from previous experiences. The powerful four-core GPU significantly improves graphics performance, thereby enriching your gaming experience. The iOS 12 operating system efficiently manages all the hardware and software of your Apple smartphone. You can store ample amount of data at one location, thanks to the 64GB internal storage offered by the Apple smartphone. The built-in lithium-ion battery lasts long, thereby allowing you to enjoy various apps without the need of frequent charging. Charging this Apple smartphone is convenient, as it supports both, fast and wireless charging. Click impeccable photos and capture 4K videos in high detail, with the 12MP rear and 7MP front camera. The 6.5inch Super Retina OLED display renders beautiful images with high resolution and pixel density. The advanced color management feature brings pictures to life. This smartphone boasts of its appealing curved design that lends it a perfect look. The dual-SIM functionality allows you to enjoy advantages of two network providers simultaneously. This dual-SIM iPhone has a 6.5inch Super Retina custom OLED display that produces incredibly high pixel density of 458ppi. It renders images at a breathtaking resolution of 2688× 1242 pixels, which gives you a lifelike viewing experience. In addition to that, the support for HDR10 and Dolby Vision allows you to enjoy best-in-class audiovisual content from a broad range of leading video streaming sites. Furthermore, this phone has advanced color management that displays your content in wider color automatically. Moreover, the images on the Super Retina display look as real as on a printed page, thanks to a six-channel light sensor subtly adjusts the onscreen white balance to match the color temperature around you. Not only that, this iPhone is IP68 water, splash, dust-resistant. Also, it can resist spills from soda, tea, coffee, and more. 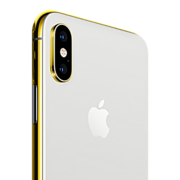 The Apple iPhone Xs Max is armed with a leading-edge combination of the A12 Bionic chip and next-generation Neural Engine. It delivers a phenomenal performance, no matter if the phone is handling heavy computational tasks or everyday tasks. The advanced performance controller dynamically divides work across six cores to get the best of both performance and efficiency. Furthermore, this phone has an Apple-designed GPU that ensures flawless functioning of video editing apps, games, and visually demanding apps. This iPhone runs on iOS 12 that is packed with loads of intuitive features, which help you get the most out of your day. Lastly, the built-in Lithium-Ion battery provides an internet usage time of up to 13 hours for uninterrupted entertainment. This Apple phone sets new standards in photography. It is equipped with dual 12MP telephoto and wide-angle cameras on the rear side. These rear cameras are capable of capturing breathtaking photos and videos. The Smart HDR feature adds more shadow detail and highlight to your photos. This phone has improved background blur for stunning portraits. Moreover, the advanced depth control feature allows you to adjust the depth of field after you capture a photo. Furthermore, the 7MP TrueDepth camera keeps you in focus against a background blur by generating a precise depth map. With the deeper, larger pixels of the camera sensor, you will get jaw-dropping lowlight photos. This Apple iPhone has a fast and easy-to-use Face ID feature that recognizes changes in your appearance with advanced machine learning. No matter if you put on a hat or sunglasses, the Face ID identifies you accurately with a glance. This feature lets you unlock your phone without the hassle of typing passwords. 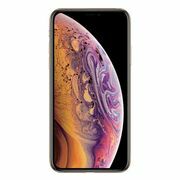 The Apple iPhone Xs Max runs on a powerful A12 Bionic chip that delivers high performance with respect to both, speed and efficiency. The neural engine, with the help of machine learning, enables your smartphone to learn from previous experiences. The powerful four-core GPU significantly improves graphics performance, thereby enriching your gaming experience. The iOS 12 operating system efficiently manages all the hardware and software of your Apple smartphone. You can store ample amount of data at one location, thanks to the 64GB internal storage offered by the Apple smartphone. The built-in lithium-ion battery lasts long, thereby allowing you to enjoy various apps without the need of frequent charging. Charging this Apple smartphone is convenient, as it supports both, fast and wireless charging. Click impeccable photos and capture 4K videos in high detail, with the 12MP rear and 7MP front camera. The 6.5inch Super Retina OLED display renders beautiful images with high resolution and pixel density. The advanced color management feature brings pictures to life. This smartphone boasts of its appealing curved design that lends it a perfect look. The dual-SIM functionality allows you to enjoy advantages of two network providers simultaneously. UNPARALLELED DISPLAY This dual-SIM iPhone has a 6.5inch Super Retina custom OLED display that produces incredibly high pixel density of 458ppi. It renders images at a breathtaking resolution of 2688× 1242 pixels, which gives you a lifelike viewing experience. In addition to that, the support for HDR10 and Dolby Vision allows you to enjoy best-in-class audiovisual content from a broad range of leading video streaming sites. Furthermore, this phone has advanced color management that displays your content in wider color automatically. Moreover, the images on the Super Retina display look as real as on a printed page, thanks to a six-channel light sensor subtly adjusts the onscreen white balance to match the color temperature around you. Not only that, this iPhone is IP68 water, splash, dust-resistant. Also, it can resist spills from soda, tea, coffee, and more. 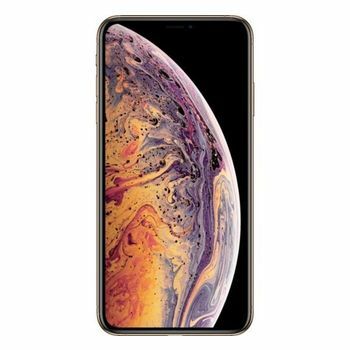 SMART AND POWERFUL The Apple iPhone Xs Max is armed with a leading-edge combination of the A12 Bionic chip and next-generation Neural Engine. It delivers a phenomenal performance, no matter if the phone is handling heavy computational tasks or everyday tasks. The advanced performance controller dynamically divides work across six cores to get the best of both performance and efficiency. 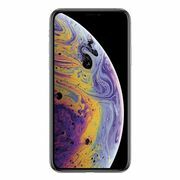 Furthermore, this phone has an Apple-designed GPU that ensures flawless functioning of video editing apps, games, and visually demanding apps. This iPhone runs on iOS 12 that is packed with loads of intuitive features, which help you get the most out of your day. Lastly, the built-in Lithium-Ion battery provides an internet usage time of up to 13 hours for uninterrupted entertainment. REDEFINED PHOTOGRAPHY This Apple phone sets new standards in photography. It is equipped with dual 12MP telephoto and wide-angle cameras on the rear side. These rear cameras are capable of capturing breathtaking photos and videos. The Smart HDR feature adds more shadow detail and highlight to your photos. This phone has improved background blur for stunning portraits. Moreover, the advanced depth control feature allows you to adjust the depth of field after you capture a photo. Furthermore, the 7MP TrueDepth camera keeps you in focus against a background blur by generating a precise depth map. With the deeper, larger pixels of the camera sensor, you will get jaw-dropping lowlight photos. SECURITY MADE SIMPLE This Apple iPhone has a fast and easy-to-use Face ID feature that recognizes changes in your appearance with advanced machine learning. No matter if you put on a hat or sunglasses, the Face ID identifies you accurately with a glance. This feature lets you unlock your phone without the hassle of typing passwords.